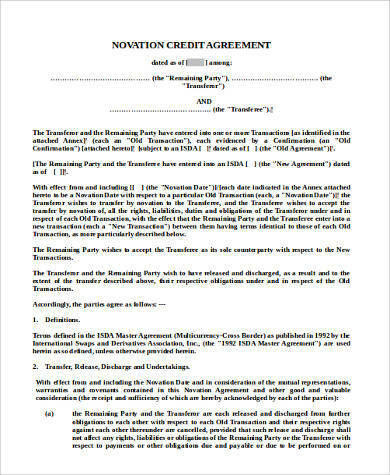 A novation agreement is usually done when an original party to a certain contract withdraws in favor of a new party or when an original contract is being replaced for a new one. 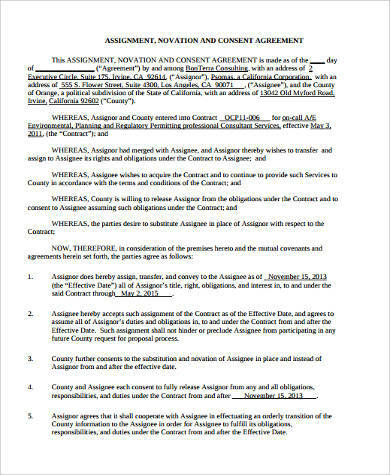 In this case, the original party to the contract is no longer duty-bound to honor the obligations stipulated in the contract. 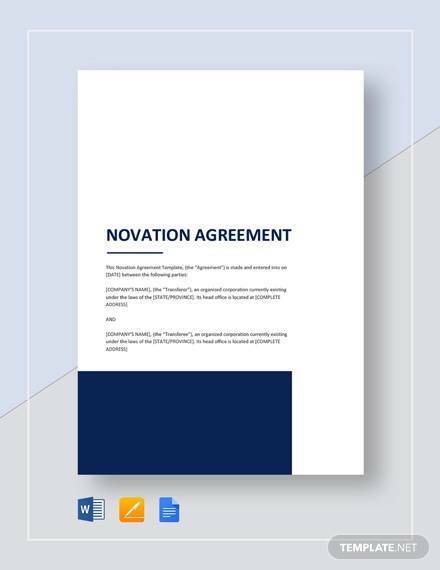 Our Sample Agreements on novation will help guide you through the process to avoid any confusion and set the guidelines on how novations are carefully worded out. These come in different outlines depending on the kind of agreement and are easily downloadable and printable in Word Doc forms and Portable Document Format (PDF) files. 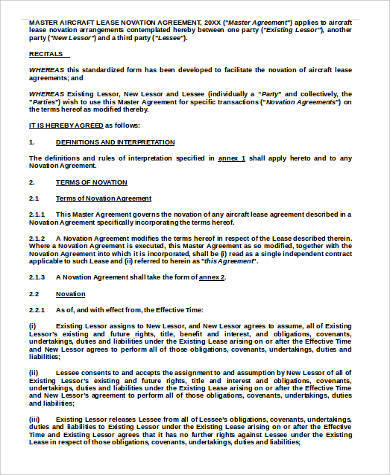 Applicable to aircraft lease novation arrangements between the existing lessor, the new lessor and a third party (lessee). 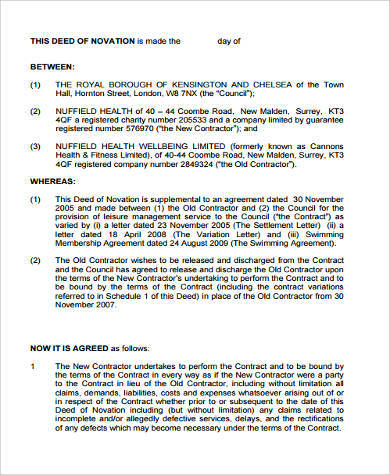 Form outline includes definitions and rules of interpretation including terms of novation agreement. 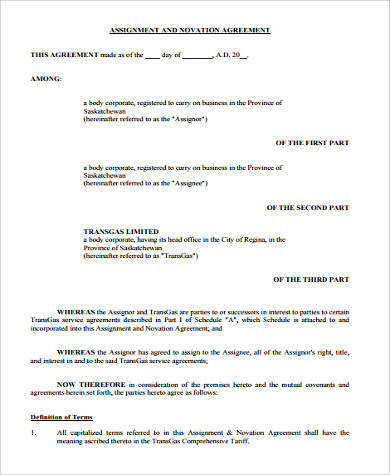 Example form outlines the details of agreement reached by both the transferor and transferee together with a remaining party on the transfer of all the rights, liabilities, duties and obligations from the transferor to the transferee and a remaining party. 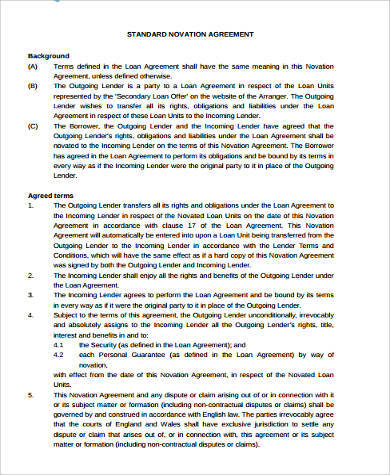 We also have Sample Confidential Disclosure Agreements available free for downloading, for binding legal contracts outlining sensitive information not to be shared between the two parties involved. 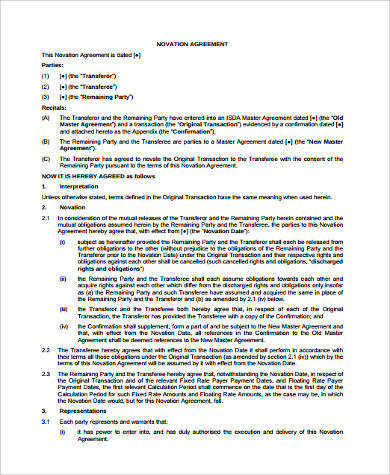 These forms can be used by individuals and companies who must agree to nondisclosure of anything covered in the agreement. Novation agreements have been proven to be very useful when some things come up that makes it impossible for one entity to meet its obligation required in a contract. There are cases when individuals in a business partnership experience a falling out due to a disagreement and one partner wants to withdraw from the partnership. That’s where a novation agreement comes handy when involving another party in place of the old one. Another case is when a company supplier can no longer meet its obligation to supply and the company has no recourse but to bring in another supplier to fulfill the company’s demands. 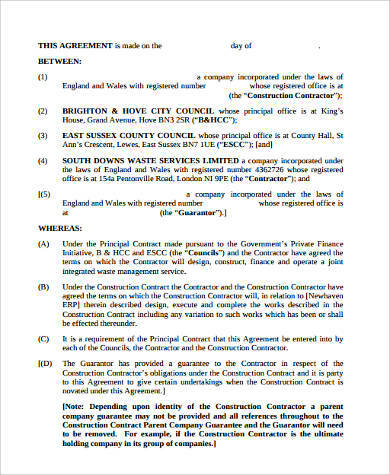 The original stipulations in the contract may be agreed to by the new supplier with the same terms and conditions set instead of making a new one. 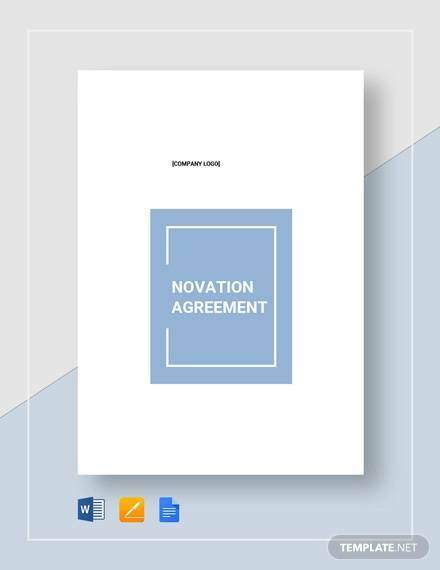 You can refer to our Free Sample Novation Agreement to find the correct outline for a novation agreement you may wish to use. These come in handy when negotiating for a release of an old business partner or supplier who can no longer carry their obligations stipulated in your existing contract. 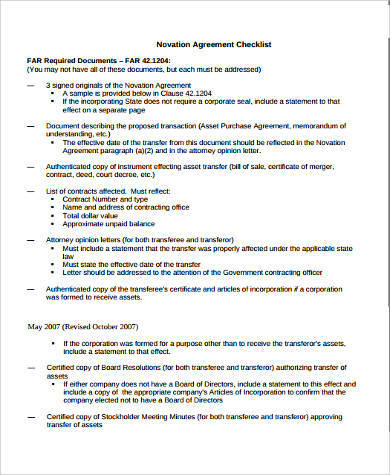 These are all available for downloading and can either be edited or modified to suit the terms you want particularized in your agreement.